North Carolina’s Crystal Coast is a treasure trove of charming towns, barrier islands, lighthouses and wild ponies situated in the southern Outer banks. Its 85-mile coastline stretches from Cape Lookout National Seashore and Harkers Island south to Bogue Banks and New River near Hammocks Beach State Park. Anchoring the northern side of the Crystal Coast is Cape Lookout National Seashore Preserve, a 56-mile long section of the southern Outer Banks of North Carolina. The Preserve runs from Ocracoke Inlet on the northeast to Beaufort Inlet on the southeast. The sound side of the island offers very shallow, calm waters to wade in. The opposite side of the island is the Atlantic Ocean side where one can find great seashells. 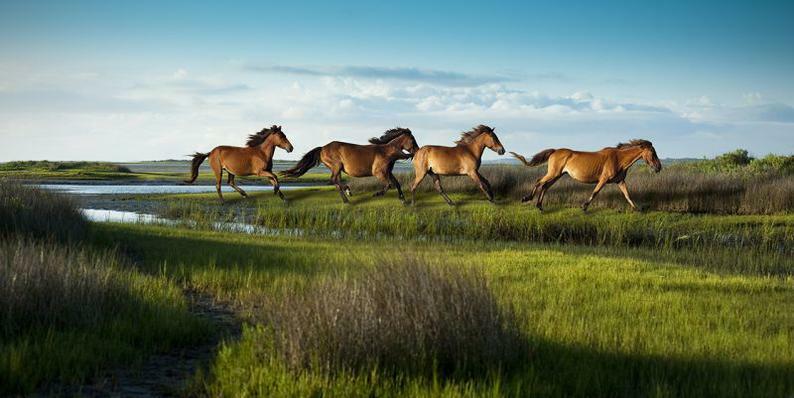 The Preserve has herds of wild horses, descendants of Spanish Mustangs, as well as the Cape Lookout Lighthouse, often referred to as "The Diamond Lady," because of its notable diamond pattern. Shackleford Banks, which is part of Cape Lookout National Seashore, is an uninhabited barrier island. The last residents departed in 1902 leaving behind a picturesque, pristine shoreline with wild horses roaming freely and loggerhead turtles nesting in the summertime. You can swing between the sound side and the ocean side, the latter of which is a good repository of shells. Farther down east is the charming, historic coastal town of Beaufort (pronounced "Bo-furt"). Located at the crossroads of a creek, sound, and the ocean, North Carolina’s third oldest town is a quaint historic seaside town full of restaurants, museums and gift shops. A small fishing village back in the early 1700’s known as “Fish Town,” Beaufort gained official port status in 1722 and started to flourish by importing and exporting goods. Doing so attracted mariners, merchants and privateers from all over the world. Not all of the worldly travelers who landed in Beaufort were desirable ones, however, and as Beaufort’s reputation as a successful port town grew, so did the influx of famed pirates, including Blackbeard the Pirate, Calico Jack, and Anne Bonney – one of the country’s first female pirates. To the southwest, lies the 25.4-mile continuous barrier island of Bogue Banks, with a unique east to west orientation of its ocean beaches facing due south and its northern beaches facing Bogue Sound. It is the only developed barrier island in the region. In 1524, the Italian navigator, Giovanni da Verrazano first visited the island while exploring the coast from Cape Fear to Kitty Hawk. Fort Macon State Park occupies the eastern 1.4 miles of Bogue Banks and features a restored Civil War-era facility as well as a museum-quality coastal education center. Nearly surrounded by water, with some of the highest sand dunes in the state, the park offers undisturbed coastal beauty and unspoiled shoreline. Also located on Bogue Banks is the North Carolina Aquarium at Pine Knolls Shores which is surrounded by the Theodore Roosevelt State Natural Area, a 265-acre maritime forest that is one of the remaining such forests on North Carolina's barrier islands. A national natural Landmark, Hammock’s Beach is a three-mile-long Island featuring pristine dunes, salt marshes, tidal estuaries and maritime forests. Many of the shells here are 7000 -10,000 years old and are being uncovered as the island slowly shifts towards the mainland. Hammocks beach is also a nesting site for loggerhead turtles. The barrier island is only accessible by boat or ferry.